Former U.S. President Jimmy Carter has said that British Foreign Secretary William Hague is an “active hero” of his, for his campaign against sexual violence in conflict zones. 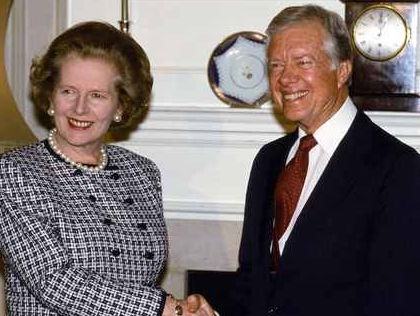 Carter also noted that former British Prime Minister and staunch American ally Margaret Thatcher knew more about America than he did when they met. Carter was speaking to the New Statesman magazine in Washington, D.C. His remarks about Hague’s work, and Thatcher’s commitment to the United States and conservatism will serve as a reminder of when British prime minister’s and American presidents worked far closer than they do today. 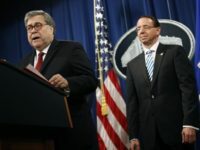 “She also knew more about my country than I did,” he joked. When asked if he was aware of British Foreign Secretary William Hague’s work with Angelina Jolie, combatting sexual violence in conflict zones, Carter responded: “Absolutely… [Hague] is an active hero of mine; he and Miss Jolie are doing a successful and admirable job”. Most recently Carter has been associated with stern criticism of British, American, and Israeli foreign policy. When asked as to whether President Barack Obama deserved the Nobel Peace Prize awarded to him in 2009, Carter is reported to have “smiled gently”, but didn’t take the bait. Donal Blaney, the founder of the new Margaret Thatcher Centre told Breitbart London: “As we prepare to remember the anniversary of Margaret Thatcher’s funeral at St Paul’s Cathedral last April, Jimmy Carter’s words remind us of the enduring importance of the Special Relationship between Britain and the United States – a relationship that transcends party divides and the challenges of history”.